After operating for 3.5 years as a tapas sake bar, BAM! 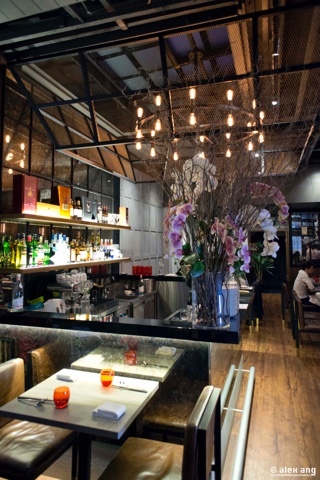 at Tras Street transitioned to a full-fledged omakase restaurant in June this year. The writing was on the wall when it acquired the next-door shop house unit last October and transformed it into a proper sit-down restaurant with 34 seats (and an additional 14 seats in a private dining room), while retaining its 12-seat counter that abuts an open kitchen. In place of it’s seasonally updated a la carte menu, BAM! now offers an array of Omakase options to fit diners’ budget: S$98++ for four courses, S$148++ for six courses and S$188++ for eight courses, with add-ons ranging from S$58++ to S$98++ if you want sake pairing. There is also a Vegetarian Omakase (S$78++ for four courses and S$98++ for six courses) and a Dessert Omakase (S$48++ for three courses and two petit fours). Executive chef Pepe Moncayo, an alum of the now defunct Santi by Santi Santamaria at Marina Bay Sands, distills seasonal produce from Japan and Europe for his clutch of daily-changing Omakase menus that reflect his Japanese-inflected Spanish approach to gastronomy. 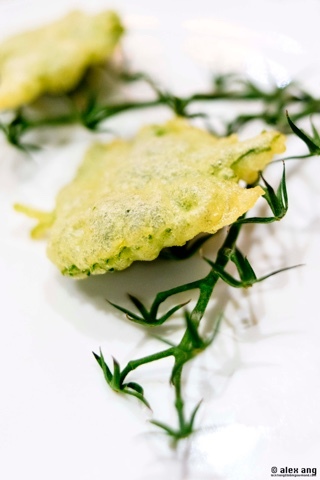 From his most extensive eight-course Omakase, shiso leaves arrive as tempura with mustard and olive oil-laced tomato tartare sandwiched in between, a fitting emblem of the Spanish chef’s cooking philosophy. 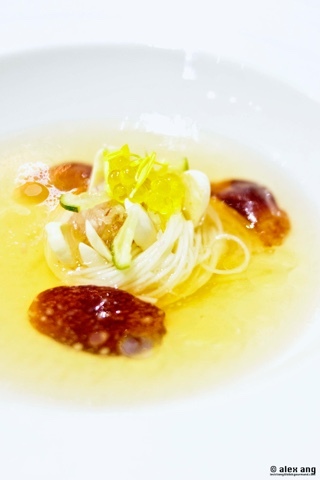 Sometimes, the dishes veer almost completely Japanese like in the invigorating course of chilled somen, which arrives with sliced Kyoho grapes and fresh almonds in a light and refreshing dashi bath perfumed with sudachi and almond oil. 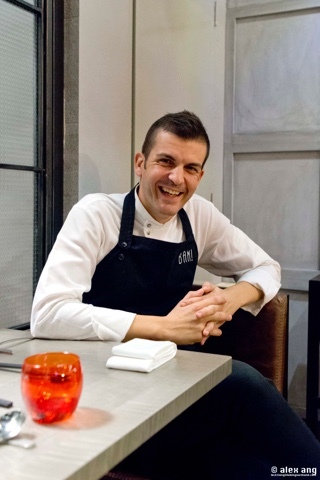 Moncayo steers it back to familiar territory in the dish of salted cod fish maw fritter. 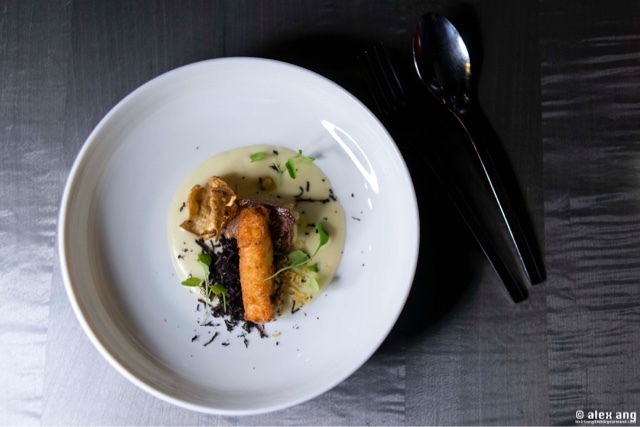 Instead of using the classic bacalao recipe of cod fish, Moncayo replaced the fish with its gelatinous maw and served it as a fritter in a shallow emulsion of Jerusalem artichoke, potato and cod loin and pil pil sauce alongside a Jerusalem artichoke skin crisp, a chunk of artichoke and Manjimup black truffle floss. If you’re lucky, Moncayo may delight you with his most prized kitchen “arsenal” – sea cucumber espardenya. 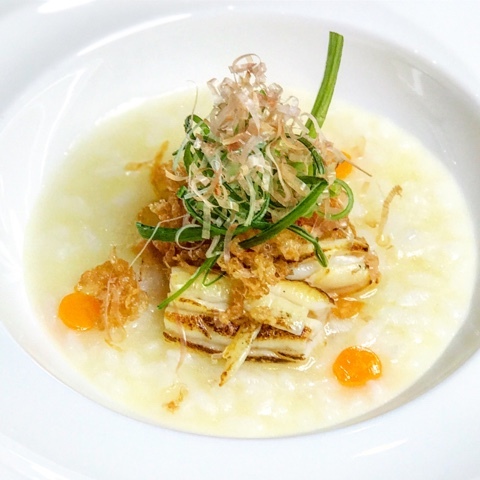 Reserved only for the priciest Omakase option, the intestine of the sea cucumber is cooked a la plancha until slightly charred but still retaining its springy bite and served in dashi porridge with a mound of egg floss, spring onions and bonito flakes. Or even the caesar’s mushroom from the Catalan region. 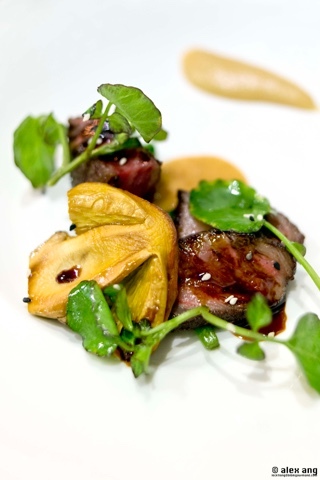 In season for only several weeks between early summer to mid autumn, the mushroom, which boasts the subtle umami of swiss brown and the bite of an eryngii, threatens to steal the limelight from the main cast of Mayura Station oyster blade wagyu. If you are ordering the eight-course Omakase, expect a parade of desserts as well as petit fours. 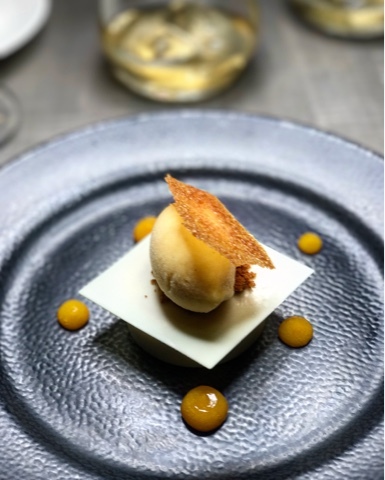 However, unlike the savoury courses, the sweets lean mostly towards the western style, think apricot vanilla sorbet on Torta de Santiago with apricot, almonds and Chantilly cream.